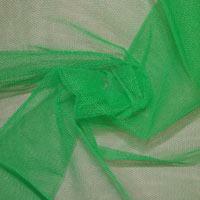 Dress Net Fabrics can be used for a variety of reasons but is most commonly used for fancy dress outfits. 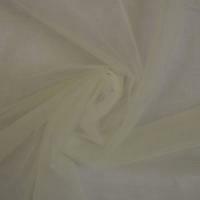 Dress Net is ideal to be made into tutus to bulk out an existing skirt or to be worn alone over leggings, it can also be a perfect Bridal Fabric; it is a stiff material that is often incorporated into bridal gowns as an alternative to softer tulle materials. Dress Net Fabric can also be used to add extra glamour to a fascinator or other headpiece, let your creativity take over as the possibilities really are endless! Our Dress Net Dressmaking Fabric are funky and fun and are available in a wide range of colours from purple, pink, cherry and many more. 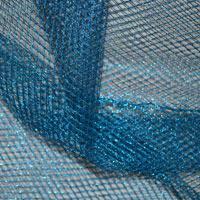 To add that extra touch of glamour to your creation Buy Dress Nets in metallic gold and silver. All of our Dress Net Fabrics are made from 100% polimide material and are produced in the UK. Whether you are creating a beautiful bridal gown, elegant evening dress or updating a fascinator it really are a versatile fabric. 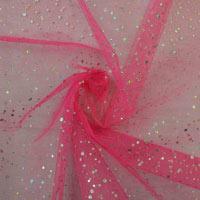 A popular Dress Net for dance costumes is our hologram spot which comes in a variety of bright colours. These Dress Nets feature a small hologram sequin design across the net which will catch the light beautifully on stage when worn for dance shows.